BRADFORD REPORTER - TOWANDA, PA, March 13, 1884. J. R. Williams' pleasant face gave us a hearty greeting. He is a successful farmer, and shows himself well skilled in his chosen avocation. He carries a choice dairy. We found M. A. McDowell one of those jolly fellows, brim full of fun, and of course had to spend an evening's visit with him. He is one of Columbia's most successful farmers, and has a pride in fine cattle and horses. He has a fine dairy, consisting of high grade Jerseys. In his stable we noticed a fine matched draft team and a very fine chestnut Hambletonian six years old. He is fleet and as gay as a peacock. He is just the horse for the buggy or saddle. Mr. McDowell having a surplus of horses offers him for sale. Mr. McDowell also gives attention to fine blooded sheep. Charles' poultry yard contains a choice line of poultry, among which we noticed the Silver Polish, and Leghorns. P. G. Stevens has proved himself a successful farmer, but is now quitting that business and will give himself to recreation. He occupies the old homestead of his grandfather, Nathaniel Ballard, before mentioned in our letters, who took the place in 1832. When Mr. Ballard came in from Burlington he was accompanied by Joel Stevens, a son-in-law, who lived with him and helped to pay for the place, and subsequently became the owner from whom his son, P. G., secured the title. Mr. Stevens having been brought up with his grandfather, recites many of his interesting stories, one of which we shall take pleasure in reciting. The Ballard boys were nine years old and then lived in Burlington. The boys kept teasing their father for the gun. He finally told them, when they had finished husking the corn they might have the gun for a hunt of two days. In due time the corn was finished, and the boys were up with the lark and off to the deer lick. At ten o'clock back came the boys. "Well, boys, what luck?" 'Seven deer, father.' And sure enough, when they came in with the ox-team and sled, their story was verified. We found O. C. Strait a very hospitable gentleman, and one of the most successful and enterprising farmers of the township. He occupies the fine estate of his father, William Strait, to which he has added many acres. He carries a large dairy of grade Jerseys and Durhams. He also gives attention to young stock, and keeps fine young horses. He is surrounded by all the comforts that would add to one's happiness. Among the prosperous farmers of the township we must mention D. C. Canfield. He occupies the place taken up by his grandfather, Oliver Canfield, who came in with Nathaniel Morgan in 1800. The first tree had not yet been felled when Mr. Canfield took up his claim. Mr. Canfield made several improvements, and after his death the place fell to his son, Bradley Canfield, who was eight years old when his parents moved from Connecticut. At the death of Bradley Canfield the place fell to his son, D. C., who was born on it, and has lived there ever since. Mr. Canfield is quitting the dairying business and is giving especial attention to young stock and sheep, keeping the latter in large numbers. He has a fine pair of young horses four years old, on of which is from the Percheron stock, Mr. Canfield is an interesting gentleman, of credit to his lineage. We found J. B. Furman another of our boys, who buckled on the sword to do his duty in helping to subdue Dixie.He enlisted in the 7th P.V.C. in March, 1864, and served until the close of the war. He was with Wilson during his famous raid, and did guard duty along the railroad near Columbus, Tennessee. His name is to be remembered with the brave who offered to give their lives for their country-and THAT is true heroism. We found Mrs. D. Lilley an interesting lady occupying the place of her husband, the late Dummer Lilley. Mr. Lilley was in his day one of the most useful and influential men of the county. He learned the art of printing in the office of the Bradford Settler, one of the first papers of the county. He was for some time connected with the Bradford Argus, and was at one time sole proprietor. His writings demonstrated fine ability as a writer. He was elected County Commissioner in 1856, and Representative in 1862, and re-elected to the same office in the following year. He had previously been appointed Register of Wills and Recorder of Deeds by Governor Ritner in 1838, and held the appointment until that office was made elective by an amendment to the State constitution. We found R. S. Killgore a very successful and enterprising farmer. He carries on dairying quite extensively, and gives much attention to the rearing of sheep, keeping the Merinos largely. Mr. Killgore keeps a fine lot of young horses, among which we noticed a very fine four-year-old from the Black Hawk stock, and a three-year-old Hambletonian. Mr. Killgore has a very fine location, and one of the most productive farms in the township. R. H. Burley is an enterprising farmer, and gives considerable attention to dairying and sheep raising. In the stock line Mr. Burley's pride is the Durhams. J. F. Bristol proved another of those good natured fellows, on whom you can crack your newspaper jokes with without getting mad. He gives much attention to the culture of bees, keeping two hundred swarms. He also carries a good dairy and gives considerable attention to farming. With Mr. Bristol lives his aged mother now eighty-two years old, also his mother-in-law, Mrs. Alfred Ripley, of the same age. Mrs. Ripley draws a pension, under acts provided for widows whose husbands were in the war of 1812. Mrs. Ripley's father, Captain Grey, was a soldier in the Revolutionary war. The Ripley family are lineal descendants of Governor Bradford, of the "Mayflower." At this time we must call attention to the Watkins family. As has already been stated David Watkins came in from Connecticut in the spring of 1800. 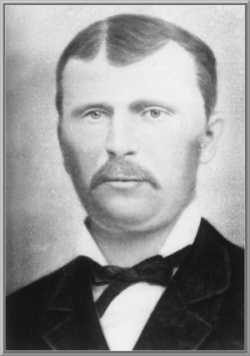 He located on what is now the farm of Mial Watkins, about a half mile below Austinville, and lived there until the time of his death. When Mr. Watkins arrived at Columbia, his worldly possessions consisted of a wife, and axe and seven dollars and a half in cash. On the way Mr. Watkins had his arithmetic stolen, which became a great privation in after years. In those days such books were written on parchment, and were highly valued. At the time of the settlement of Columbia the pioneer had to go to Tioga Point to mill and do their trading-and even to grind their axes. We have it that the grindstone which was owned at the "Pint" was bought by a man who had settled in Smithfield, who refused its use to the fathers of Columbia-a mean fellow he was. When Mr. Watkins came in he bought the only scythe which the community afforded for some years. Mr. Watkins raised a family of ten children, four boys and six girls, seven of whom are yet living. The oldest, Laura, born in August, 1800, was the first born in the township, and is yet living. Her birthplace was under the roots of a huge pine tree partly turned up, which Mr. Watkins had formed into a sort of house. Her cradle was a sap trough. Mr. Watkins died in 1862 at the age of eighty-two years. William and Mial Watkins, sons of David, reside at Austinville, with whom we spent pleasant visits. They are both gentlemen ripe in years, but are blessed with a sufficiency of this world's goods to make them happy in their declining years. They have been hard working men, and being of a fine physique will undoubtedly last many years yet. 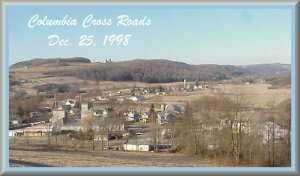 COLUMBIA X ROADS In the beautiful valley of the north branch of the Sugar Creek, along the line of the Northern Central Railroad, four miles north of Troy, is situated the village of Columbia Cross Roads, (so called from the intersection of the public roads at that point). The village comprises a population of one hundred souls, and is now improving rapidly. It is an important shipping-point in grain, bark and cattle. Last year ninety-six car loads of cattle were shipped, and two hundred of bark and grain. 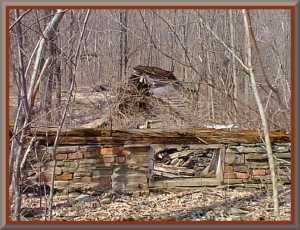 The settlement of this locality dates from 1799, when Eli Parsons and son Eli came in from Enfield, Connecticut, and took up four hundred acres under the Connecticut title which proved worthless. They built a log cabin near the Cross Roads. Mr. Parsons returned to Connecticut in the same year, but Eli, Jr., staid and chopped a fallow during the winter. He boarded with Reuben Barber, or as he was known "Dr. Barber," who was of Indian extraction. We think Barber lived in what became Troy township at that time. In the spring of 1800 young Parsons put in some crops. During the year his father moved in the family from Connecticut. Mr. Parsons was a tanner and currier, and carried on that business as soon as he could make the necessary preparations. In the meantime, however, he went to clearing up his land which he paid the Pennsylvania claimants for at the rate of one dollar per acre, or a bushel of wheat. Mr. Parsons had been a soldier in the Revolutionary war and drew a pension. He died at the Cross Roads in November, 1834. In 1810, Eli Parsons, Jr., located on the farm now occupied by his son A. S. Parsons, where the latter was born and has lived ever since. Eli Parsons, Jr., died in 1829. Mr. Parsons married Hannah Rockwell, daughter of Samuel Rockwell. The Rockwell family consisted of nine sons and a daughter. One of these sons, Luther Rockwell, also raised a family of nine sons and a daughter, which we have already adverted to. In the days of the senior Parsons the courts were held at Williamsport, and the most of the trading was done there. We have it that Mrs. Eli Parsons, Jr., when a girl with her mother, took on horseback $50 worth of maple sugar to Williamsport which they exchanged for articles of comfort. There were no bridges then, and they were compelled to ford the creek forty times. Mrs. A. A. Parsons is a daughter of Jessie Taylor, late of Towanda. Her grandfather, Jas. Thayer, was one of the first settlers in Susquehanna County, and was a soldier in the Revolutionary war. M. S. Parsons, an electro-pathic physician of the firm of E. H. Parsons & Co., of Baltimore, is a son. Mr. Parsons is a extensive farmer, and carries young stock and sheep very largely. Again, adverting to Columbia Cross Roads of today, we find there a snug little store filled with the choicest articles of all kinds, by C. H. Gernert. Mr. Gernert is a young man of stirring business qualities, and his pleasant face and strict reliability can not fail to make him many customers. A second store is kept by C. S. McClellan, who has been in the mercantile business at the Cross Roads for seventeen years. It is evident from the crowds thronging his store, that he has many friends and is doing a fine business. Mr. McClellan is postmaster, keeping the office in connection with his store. McClelland & Furman run a steam saw mill with a feed mill attached, having a capacity of three hundred bushels per day. They do general custom and merchant work. The hotel is well kept by J. P. Strong, who has been in the hotel business continuously at the Cross-Roads for thirty-three years. J. H. Strong is the efficient and accommodating depot agent and operator, having acted in that capacity ever since the office operated. He also deals in hay and grain very extensively, giving especial attention to buckwheat and oats. Mr. Strong keeps two portable presses employed in preparing hay for shipment. The place also affords a church edifice and a school building. Our Visits Continued We found E. D. Brown cosily domiciled, and his face radiant with smiles. Mr. Brown has a neat little place, and is a thorough going gentleman. Among those who came to Columbia at an early day was John Peter Gernert, who came from Germany when a boy. We have it that on the same vessel in which he came, also came Miss Anna Budd from the same country accompanied by her parents. She subsequently became his wife. The vessel came in port at Philadelphia, where the young couple worked some time to pay for their passage. During the voyage the vessel encountered a fearful storm, ridding it of its masts and sails. For several weeks they wafted backwards. They were saved from starvation only by the fruits of the mighty deep. During the Revolutionary war it appears that Mr. and Mrs. Budd followed up Sullivan's expedition doing service for the army. They were taken sick and died at Tioga Point, now Athens, and are said to be buried at the junction of the Chemung and Susquehanna. William Gernert was a son of John Peter, and was born in Philadelphia in 1788. His people moved to Athens when he was a mere child. He lived there until he had reached manhood, then moved to Columbia township. He occupied the Batterson place now owned by J. H. Struble. W. H. Gernert is a son of William Gernert, and is a very successful farmer. His life has been one of hard work, and many acres have been cleared through his diligence. Now may he enjoy the comforts of his labors. W. E. Gernert is a son of W. H. Gernert, and is a very prosperous young farmer, giving attention to the Hollenstein stock. J. P. Gernert is a son of William Gernert, and is a very prosperous farmer. He carries a large dairy consisting of thoroughbred and grade Jerseys. He also gives much attention to sheep keeping, the Cotswold and Southdowns. He keeps fine stock as well in the horse line. S. G. Gernert is another of the sons of William, and is a prosperous and successful farmer. John Peter Gernert was the first postmaster at Columbia X Roads, and acted in that capacity for thirty-three years. He died in 1869. Errata For Last Week First paragraph -1709 should be 1799 Fifteenth paragraph - Furniture store should be first store. Twenty-first paragraph - Martha Bruce should be Martha Brace. Also-his father, William Bruce, should be her father William Brace. COLUMBIA TOWNSHIP Columbia X Roads D. B. Sherman is prominent among the successful farmers of the township, and is one of our representative men. He is improving his dairy by adding fine young Durham stock. Some of his young heifers took first premium at the Troy fair last week. Mr. Sherman has recently been adding to his land possessions. We visited the old home of Edward Young, father of Esquire Young, of Towanda, and well known to the people of Bradford County. Mr. Young was of English parentage, and was born in England. He lived at Towanda for a number of years, and there married a daughter of Jesse Woodruff. Mr. Young moved to Columbia and occupied the farm now held by Mrs. Henry Young and heirs, in 1839. Mrs. Young has had charge of the farm since here husband's death. He was a son of Edward Young. A. Buchanan is a prosperous farmer, and can now enjoy the cold wintry days with the comforts of a king in his cosy new home. He carries a fine dairy consisting of grade Durhams. He also has a pride in fine-blooded horses. In this line we noticed a fine matched span of young Hambletonians, and a couple of blooded breeding mares, also a fine pair of colts. T. Gustin is another of the enterprising and successful farmers of the township. He gives especial attention to dairying and breeding, having fully prepared himself for carrying on this industry. His fine new barn is a model in arrangement, and has a capacity sufficient for his large farm. His stock are the Jerseys, consisting of grades and thoroughbreds. He has a fine male, Grey Bradford, No. 12,008. We found L. Wolf a very pleasant gentleman and enterprising farmer. He has a pleasant location and carries a snug little dairy of the Durham line. He gives especial attention to oats and buckwheat, which he generally grows in large crops. We found J. H. Watkins happily domiciled in his snug little home, and an enterprising farmer. Mr. Watkins, like nearly all the farmers of Columbia, has an eye to fine stock, and keeps the Jerseys and Durhams. Further we must mention a fine pair of Devonshire steers two years old. Mr. Watkins has a very fine team suited for general purposes. He has recently bought the John Furman farm where Rathbon, Eldridge & Co., opened their iron mine some few years since. In 1879 the first daily mail was run from Austinville to Columbia X Roads by Mr. Watkins. Our visit with P. C. Slade and family proved a most interesting one. Mr. Slade is a son of Phillip Slade, who came to the township in 1818 from Bristol, Massachusetts, and located on the farm which his son now occupies, and where he was born and has lived ever since. With Mr. Slade lives his mother, "Laura Watkins", the first child born in the township of Columbia. The old lady physically is very strong, and moves with much agility without the use of a cane. She frequently walks to Austinville, a mile distant. She sees to "her chores" with the promptness of her younger days. Her husband died in 1875, at the age of eighty-seven years. In connection with this visit we had the pleasure of meeting ex-Chief of Police Knapp, of Elmira, whom we found a most interesting gentleman, conversant with the topics of the day. He was somewhat reticent as to his own thrilling history, but was full of the "right kind of politics." Mr. Knapp was Chief Police of Elmira for fifteen years, but was compelled to resign on account of failing health. He is a brother of Mrs. Slade. The many interesting hunting stories which Mr. Slade recited we must defer until a subsequent letter. Mr. Slade is an enterprising farmer, and gives especial attention to young stock. In the horse line he has a very fine filly Black-Hawk Hambletonian, also two colts-one from Wood's Clydesdale, the other from the Morgan stock. J. H. Killgore is an interesting old gentleman,and gave us a very pleasant reception. He came to Sylvania from New York State in 1839, and followed the occupation of a tailor. He lived there for a couple of years, then moved to Gernert Hill. In 1844 he bought the farm where his son Ray now lives, remaining there until 1877, when he quit the farming business and retired to Sylvania to spend the remainder of his days in comfort. Mr. Killgore has been a careful manager, and has accumulated a fine fortune. He has been twice married and has raised a family of nine children. Will some of our young readers tell how many birthdays he has had - being born February 29th 1808? In the narrow valley of the north branch of Sugar Creek, near its headwaters, on the line of the Northern Central Railroad, is situated the village of Snedekerville,with a population of seventy souls. It is a milling town, and takes its name from W. H. Snedeker, who put in a mill in 1865, and began carrying on the lumbering business extensively. To accommodate Mr. Snedeker's business a switch was put in by the company in 1866 and a post office established. Mr. Snedeker is a large land holder, having purchased the land to obtain the timber which he has already manufactured in great quantities. His mill is a superior one, and gives constant employment to several hands. He does custom and merchant work. A general store is kept by Jerry Ryan who is also station agent. The place affords a public school Other than lumber but small shipments are made from this point. The first person to settle in the vicinity of Snedekerville was Robert Potter. Our Visits Continued We spent a very pleasant evening with Mr. O. W. Besley and family, finding Mr. Besley conversant with many interesting facts of the early history of his town. He is a son of Isaac Besley, and grandson of Oliver Besley, a French Huguenot who came into the township in 1812 from New York State, and settled on the Batterson place, now occupied by the Bensley brothers. Isaac Besley married Rebecca Watkins, a daughter of David Watkins. Among interesting reminiscences Mr. Besley recounts the following: "When the old house, which remains on the Besley place, was being built, my father in January hauled the stones for the chimney bare-footed and bare-headed. While the Battersons were living in the valley below Austinville, a family moving to the Tioga river stopped them for the night. They had brought a cat with them which the Battersons gave five bushels of wheat for." This was probably the origin of cats in Columbia. "Shoemaking was conducted very much differently in earlier days than now. The journeying shoemaker would go from house to house, carrying his ?? (can't read) his shoulders, and make up the necessary supply for the family. Each family furnished its own leather and this was cowhide. There were no fine shoes then, all were satisfied to get those made from the cow hides." Mr. Besley indulged our curiosity by showing us a Chinese cane which he possesses. We found Morris Fairbanks one of the most successful and thrifty of the Columbianites. He is an extensive farmer and real estate owner. Mr. Fairbanks is a son of Samuel Fairbanks, who came to Columbia in 1831 from Massachusetts. When he reached the land of his hope he had fourteen shillings in money. But hard work and economy kept enlarging the pile until it had developed into a fine property. Mr. Fairbanks now owns the ancestral estate. Our visit with Alden Keys proved a most pleasant one. Mr. Keyes is a genial and accommodating gentleman, and grandson of Charles Keyes, one of the first settlers of the township. He located at Sylvania early in the nineteenth century. Mr. Keyes was Mercantile Appraiser of Bradford County in 1883. J. H. Struble is one of the most thrifty farmers in Columbia. He has a very pleasant location and carries a fine dairy, and considerable young stock. His young team is one of the finest we have yet seen. They are of the Hambletonian stock. Among our pleasant interviews with the soldiery we must not forget to mention our visit with E. D. Benedict. He was a member of the 12th Pennsylvania Reserves, McCall's Division, and enlisted in June, 1861. He was captured at Mechanicsville in 1862, and suffered the cruelties of Belle Island prison for some months. The horrors of this "hell pit" were so full of barbarity that it would only stir one to indignation to recite them. After having been paroled and sufficiently recuperated, he again joined his company and participated in the battles of Gettysburg, Wilderness and Cold Harbor. I. S. Aspinwall is a genial gentleman and prominent farmer and capitalist of Columbia. He owns the farm taken up by the Havens family in 1808. They were a numerous family, and Carter Havens was the father of twenty-two children. We found Nathaniel Morgan a gentleman of the same pluck as was his grandfather after whom he is named. One lent his hand to help subdue a mighty wilderness, the other to subdue a rebellious South. Mr. Morgan enlisted on President Lincoln's first call for three hundred thousand, and was a member of the 7th P.V.C. He served as a bugler, but carried a sabre and carbine. He was at the battle of Murfreesboro, where the loss sustained by the contesting armies was one-fourth of the number of men engaged. It was a signal victory for Rosecrans, who at its close held high mass and gave to God the glory of the result. In this battle Mr. Morgan was taken prisoner by General De Forest, but was soon paroled. Mr. Morgan is a son of James Morgan, as is John a highly respected citizen. We found Frank Huntley a genial gentleman, who is about to occupy the H. Furman place near Altus. He has some choice stock in the Jersey line. He has a good reliable draft team. O. B. Besley is domiciled in a fine new home and is surrounded by the luxuries of life. He occupies with his brother John the Batterson place which was purchased by his grandfather, Oliver Besley, who came from New York State in 1812 and occupied it. Upon the death of Mr. Besley the farm passed to his son John, whose sons now hold it. Mr. Besley carries a fine dairy in the Jersey line, as well as a superior grade of sheep. He has a fine Norman colt. J. M. Williams has a pleasant location and is an enterprising farmer. His dairy consists of grade Durhams and Jerseys. He has a very fine Hambletonian colt, thoroughbred, which has taken the first premium. We found O. B. Howland an enterprising farmer, having a pride in fine stock. He has some very fine grade Jerseys and thoroughbreds. He has a registered male from one of the finest strains. Mr. Howland has a cow whose grandmother took first premium at the Centennial. Mr. Howland's father, M. Howland, moved from Delaware County, NY to the township about fifty years ago. His grandfather, Gresham Howland, was a distinguished Methodist clergyman. Among the hardy pioneers who lent their arms of strength in helping to make Columbia a place of beauty, none is more worthy our recognition than the Wolfe family. This family was a very numerous one as will be seen. In February, 1811, Michael Wolfe came in from Colchester, Delaware, and located about two miles north of Columbia X Roads, on what is now known as the place of Mrs. F. B. Wells. In 1823 Mr. Wolfe moved on what is now the place of Nelson Wolfe, and there began the first improvements in "Wolfe Hollow." Mr. Wolfe's family consisted of eight sons and three daughters. These were Abigail, William, George, John, James, Michael, Martha, Rensselaer, Nelson, Horace and Maria. The sons joined with their father in improving the lands, and fully a thousand acres were cleared up by the Wolfe family. The sons married and located in the valley near their father, hence the name -"Wolfe Hollow". Only three of the Wolfe family are now living-Rensselaer, Nelson and Horace. Michael Wolfe died in 1855 at the age of eighty-six years, and his wife in 1865 at the same age. Their remains lie in the family burying ground on the place of Nelson Wolfe. Photo of painting of Michael Wolfe sent in by Carlton Wolfe. A.B. Moore has a very pleasant location and home. He is an extensive farmer and keeps a large dairy. He also keeps young stock and sheep extensively. He is a son of George Moore, who came to the township about sixty years ago from Springfield..
We found M. T. Shoemaker a genial gentleman, and one having a pride in fine stock. He carries a fine dairy, and has some very fine young stock in the line of the Ayrshires and Holsteins. Mr. Shoemaker's aged mother, a resident of Granville, is ninety-six years old. Mr. Shoemaker has in his possession a very interesting relic-an Indian battle axe-it is of blue flint and was found in Granville. Among other early families we must note at this time the Peckhams. They were three brothers-Peleg, Kingsley and Stephen. Peleg came from Reholeth, Massachusetts, and located on a part of a part of the farm now owned by Charles Gladding in 1818. He was a carpenter and built some of the best houses of his time. Kingsley bought the Merritt location near James Bullock's. Stephen began where he now resides, cutting the first tree and developing his possession into a place of beauty. Mr. Peckham has a prosperous farm, which is in charge of his son Clarence. They carry a fine dairy of grade Devonshires and Ayrshires. Our next visit with Nelson Wolfe proved a most enjoyable one. Mr. Wolfe is a gentleman of ripened years, yet with a clear instinct and a heart as warm as the warmest with which man is endowed. Mr. Wolfe is a son of Michael Wolfe, and endured the hardships of pioneer life with the rest of the family. He has a fine and prosperous farm which is in charge of his son, J. D. Wolfe, an excellent gentleman and most successful farmer. He has a superior dairy consisting of the Holsteins. His stock is indeed, very fine and his registered Holstein bull one of the finest we have yet seen. Mr. Wolfe also has a pride in fine young horses. We found the "Wolfe boys", John H. and G. H., very prosperous young farmers near Snedeker's Their farms are large, and of an excellent soil. Their buildings are commodious and of credit to the owners. They carry fine dairies in the line of the Durhams and Devonshires. They also give considerable attention to young stock. They have a fine Devonshire bull which took the first premium at Wellsboro. Before we conclude we must call attention to the Wilson family, which, though not among the earlier inhabitants, has been one of the most energetic and prosperous families of Columbia. We wish to express our indebtedness to the good people of Columbia for their kind hospitality and assistance in furnishing the many interesting notes from which we have compiled our letters. With a few more items of interest we are done. P. C. Morgan as the early inhabitant of Columbia well known like Nimrod of old was a mighty hunter. On one occasion he went out to watch a deer lick. To be hid from his prey he climbed into a tree. After patiently waiting for some time the object of his anxiety made its appearance but before he could bring his gun to his shoulder, from over his head, with a movement as quick as lightning sprang a huge panther, and alighting upon his prey with his terrible fangs soon made life extinct. Though Mr. Morgan was a brave hunter he dared not shoot, and was only too glad to let the panther go his way if he would let him go his. He accordingly crawled down the tree and cautiously made his retreat, though deprived of his game that day. One Harry Harris began on what is now the place of Joel Watkins. He was engaged by a neighbor, Havens, living some two and a half miles distant, to do some butchering. He tarried until evening, then taking the "pluck" for his day's work started for home through the wilderness. When he had made the greater part of his journey he saw something dark cross his path, and concluded at once it was a panther. His only avenue of escape was if possible to reach his cabin. How this might be accomplished was the great problem revolving in his mind. He now knew, the panther had passed to his rear, and was close upon his heel. He was at last equal to the emergency. Taking his knife he clipped a slice from his "pluck", then pushed on with his greatest effort while the voracious beast was appeasing his appetite with the palatable "slice". He kept repeating this operation until the last parcel was dropped. He finally succeeded in reaching his cabin, but just in the nick of time, as the animal was so close upon his heel that he scarcely closed the door upon him. However, by thus husbanding and using judiciously his "pluck", he saved his "bacon".